Josiah Martin was born the son of Josiah Martin (1699-1778), appointed a member of Antigua’s royal council in 1735. After the elder Josiah Martin served as president of this council from 1748 to 1750, he moved his family to Rock Hall on Long Island, where he served on New York’s royal council and as a member of the first board of trustees of King’s College (now Columbia University) in 1754. In Long Island, Josiah Martin and other children in the family were educated by William Smith who had come to New York with the Martin family in 1751. 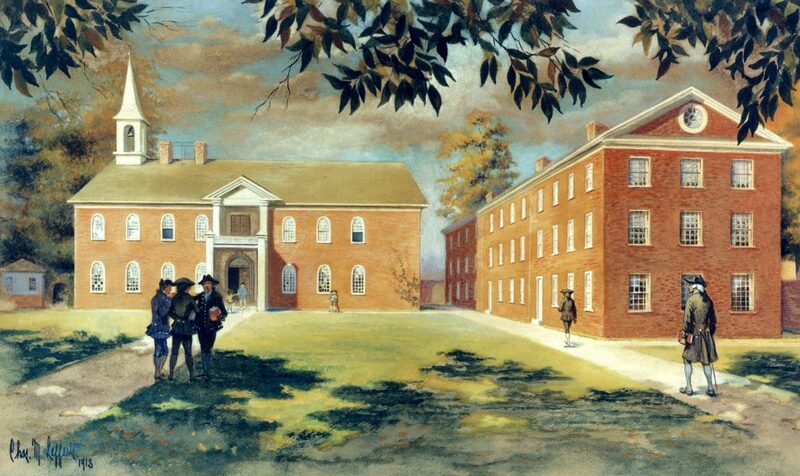 Josiah and his brother William Thomas Martin were enrolled as students in the Academy of Philadelphia in 1753, shortly before Smith became a professor and then provost of the new College of Philadelphia (now the University of Pennsylvania). Josiah Martin graduated in absentia with Penn’s first graduating class, receiving his A.B. in 1757. In awarding this degree in May of 1757, the minutes of the College trustees note that “Josiah Martin, by now a student at the Temple, was a youth of promising genius, who had finished the requisite course of studies.” Josiah had left the Academy in January of 1756 to travel to London to study law at the Inner Temple. William Shippen, Jr., son of founder and trustee Dr. William Shippen, was studying medicine in London and Edinburgh at the same time, and the two dined together in London in July of 1759. Martin died only a few years later, still a young man of unfulfilled promise. There has been some genealogical confusion between this Josiah Martin, A.B. 1757 (died 1762), and another Josiah Martin (1737-1786) who became a royal governor of North Carolina. This confusion is rooted in family ties between the two Josiahs. It appears that the grandfather of both men was Samuel Martin, a planter and royal official in Antigua, who had sons named Samuel, Josiah, and William Thomas Martin. Josiah Martin (1737-1786), the future governor of North Carolina, was the son of Samuel. Josiah Martin, A.B. 1757, was the son of Josiah, who moved to Long Island. To further complicate things, Josiah Martin (1737-1786) also studied law, if briefly, at London’s Inner Temple, before becoming a military man; and this Josiah Martin (1737-1786) stayed with the Long Island Martins during the Seven Years War, marrying his cousin Elizabeth Martin in 1761. Thus the two Josiah Martins became brothers-in-law.